What’s the difference between a jaguar and a leopard? Both have a tawny coat with black markings, but jaguars are larger and stockier. Leopards live in Africa and Asia. They also live in Central and South America. Jaguars have a tawny coat with black markings that are larger and stockier than leopards. Keep reading for more all about jaguars. Jaguars are big cats. Only tigers and lions are bigger. Males weigh up to 250 pounds, while females are smaller. Like all cats, jaguars are carnivores. They hunt their prey by stalking it through the grass and trees. Then they pounce for the kill. Jaguars eat wild pigs, turtles, cattle and even caiman, which are like alligators. Jaguars are nocturnal. They lounge around during the day and hunt at night. Some jaguars are black with spots. 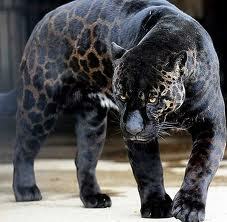 They are sometimes called panthers, but they’re really jaguars. 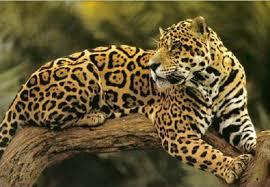 The native South American word for jaguar, “yaguara”, means animal that kills in a single bound. Jaguars love to swim in lakes and rivers. Jaguars wave their tails over water to attract fish. 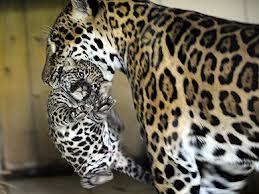 Jaguar moms usually have two babies at a time. A documentary about jaguars – their lives and difference between leopards. Question: Are jaguars good mothers? Answer: Jaguar moms usually have two babies at a time. The babies’ eyes are closed when they are born. Mom takes care of them for up to two years. Question: Do jaguars live in prides? Answer: Jaguars live alone except when a mother is raising her cubs. Enjoyed the Easy Science for Kids Website all about Jaguars info? Take the FREE & fun all about Jaguars quiz and download FREE Jaguars worksheet for kids. For lengthy info click here.